It's autumn - the summer crowds are gone, the countryside is at its most beautiful and the fish are feeding hard in preparation for winter. But you've got to find them first. Better to spend three hours looking for the fish and an hour fishing the right place than to fish a barren spot for four hours. It sounds like hard work, and it is, so how about some simple science to make it easier? As summer fades, fish adapt their behaviour to the changing conditions. The water cools as the nights grow longer. Cold water can hold more dissolved oxygen than warm water, so oxygen levels in autumn are always within the fish's preferred limits. The simmering days of summer when the fish bask and won't bite are gone. Like us, fish aren't too keen on the cold, so once the oxygen level is adequate they seek the warmest water. Find that, and you've generally found the fish too. In autumn, water temperatures tend to vary widely and the fish adapt their behaviour to suit. To help you follow the fishes' movements, a thermometer you can cast into the water is a vital piece of equipment. Water is a peculiar liquid in at least two ways. Firstly, it takes a long time to change temperature- much longer than air. So in early autumn the water is almost at summer temperatures, even after a day or two of really cold weather. Later on, however, when the water has cooled to more like winter temperatures, even a couple of days of mild weather doesn't warm the water up more than a fraction. Water's second strange habit is its behaviour as it cools. Above 4 oc (39°F) it's just like any other liquid- the colder it gets, the denser it becomes- cold water sinks. So in early to mid-autumn, before water has cooled to below this temperature, the warmest water is in the top layer. Later on, when the water has cooled to this temperature, strange things happen. Below 4°C (39°F) water actually gets less dense as it cools- the opposite to what it did before. So in autumn, as the water at the surface cools to below this temperature, it floats on the denser water underneath (which is at 4°C/39°F), instead of sinking. The warmest water is therefore at the bottom. In many waters, the temperature there stays at 4 oc (39°F) from autumn right through to spring, unless the weather is very harsh or the still water very shallow. That's why fish tend to gather in the deepest areas. Perch in particular, form tight shoals and gradually migrate to the deepest spots, because they're the warmest. However, the surface layers (and shallow water) do change temperature a little faster. So on mild, sunny days these areas warm up most quickly, no matter how cold the rest of the water. 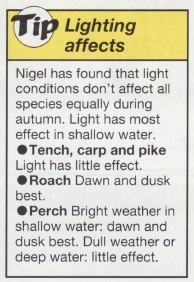 If the temperature in these places climbs above 4 oc (39°F), or it's still early autumn, look for fish, especially rudd, chub, carp and tench, in the warmer, shallower water. You can catch them there if you don't disturb them first. But on chilly days, these areas are cold and fishless. Autumn is a period often associated with windy weather. Strong winds can stir up the water so that it is all the same temperature. If they are less severe they tend to blow any warm water at the surface to the downwind bank- and the fish follow. If the water is less than 4 oc (39°F) at the surface, the warmer water at the bottom may be pushed back towards the upwind bank by the colder surface water collecting at the downwind bank. 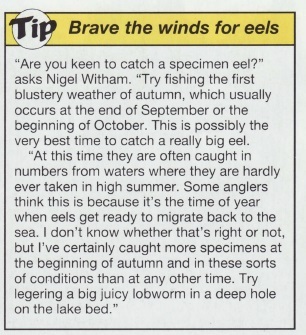 This is quite rare, but when it does happen the fishing is often best with the wind at your back. Come October, the trees begin to lose their leaves. Some anglers prefer to avoid treelined areas, believing that fish don't like decomposing leaf litter or that they won't find the bait for leaves. However, the bubbles you see all season are methane gas- a by-product of decomposing leaves and other detritus. This process continues all year but it's slower during cold weather because the bacteria that cause it are less active. So if anything, avoid these areas in summer, not autumn. All of the above applies to every type of still water but there are some more specific points to bear in mind. With lakes and reservoirs formed by damming a stream, it's usually quite easy to work out the contours. The deep water is always by the dam and the deepest of all is where the old stream bed lies. If you can find this you will almost certainly find a regular hotspot for the coldest days. On the oldest lakes the stream bed may have been filled in by deposition, but there is nearly always something left. It's a great help if you are lucky enough to have a boat with an echo sounder (and permission to use it). If not, then it's back to hard work with the plummet. On gravel pits and other workings, such as clay and chalk pits, the underwater profile can be quite different from the one you'd expect to find in estate lakes, ponds and reservoirs which are generally deep in the middle and shallow near the edges. 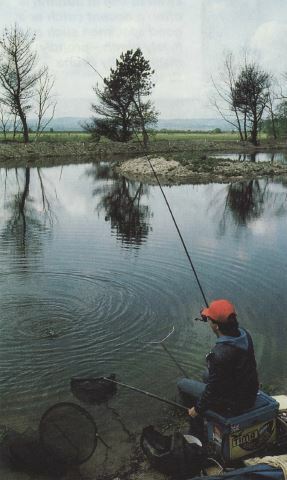 Gravel pits often have shallow areas away from the banks and any deep water between these shallows is often a hotspot. If the pit you fish is large, wait until the close season when there is time to plumb accurately without disturbing others. 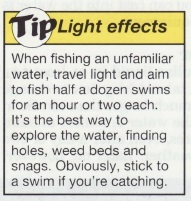 Having found the general area in which to fish, don't forget the usual pointers. Tench and carp prefer a muddy bottom but most other species like a hard clay or gravel bed. Look for cover - especially old tree stumps in the water and reed and lily beds, which die back in the autumn. Potamogeton is a lily-like weed with very small dark green leaves on the surface. Most species of fish love to hide in it. Whatever species of fish you want to catch, it pays to add the ability to use water temperatures to your armoury of water craft skills. If you do, autumn will become your favourite time of year.